One of our largest successes. On the nomination list for Game of the Year 1996. Rank 4 at the Deutscher Spielepreis 1996 and Card Game of the Year in Germany 1996. A very special 5 suited card deck with wonderful artwork by Doris and a collection of 5 different games. 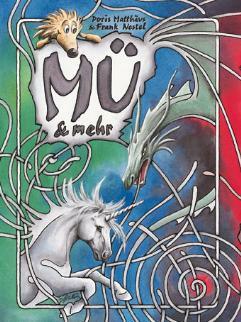 Most well known Mü itself, a trick taking game with variable partnership play and a very special bidding phase. The game is highly tactical and a must for experienced card players. A deck with a collection of 5 games, including the trickster Mü. A trick avoidance game, slightly like Hearts, but with a few twists. E.g.there is also a positive scoring colour and a high bonus for the last trick. Trick annoucement game with extra bluff. Is best compared to the Casino family: You have to capture cards from the table by 3 different methods. Best with 3 players. There have been a few Mü tournaments conducted by me, and it seems like Mü is pretty suitable for tournaments. Future information about (hopefully future) tournaments will be collected at another page of this site. Like Ursuppe, Frank's Zoo and Igel Ärgern Mü is another long living game, but unlike the other it has appeared in various different versions. After our initial and the Amigo edition was sold out, we produced a new one in a smaller box. From September 2007 available from Amigo and Rio Grande Games is the collection of card games 4in1. Contained beside Mü are "Was Sticht", "Njet" und "Meinz" (bekannt als "Willi"). Amigo held a license of Mü from 1996 to 2001 and sold a slightly different edition with only four games in the box and the Hedgehog suite replaced by Fishes. The rights are now returned to us and we are considering, republication of Mü maybe in a smaller package. The box was much larger, hindering you to take Mü wherever you go. But on the other hand there was one game more in the box (for a total of 6). A fast crossover game which requires blackjack skills and a good memory. Best played with 2 and 3 players.